The Adirondack Mountains are a special place; a place of rare and unequaled beauty. The sunrises and sunsets over the mountains are always unique and have a character like no other place. 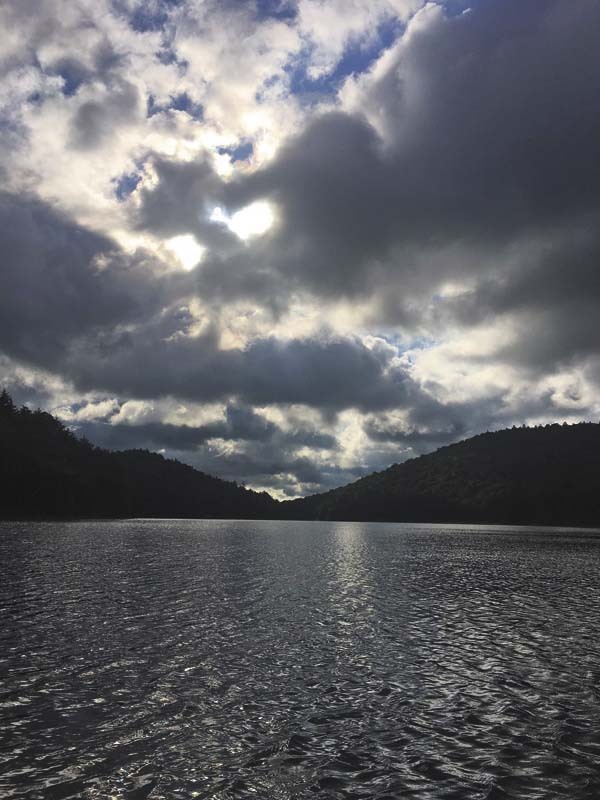 Just look at some of the photographs posted on social media of the Great Sacandaga Lake and you’ll see why Fulton County is a place of beauty. This fall, because of all the rain we have had this summer, I expect that the foliage will be spectacular. Even our native trout have a unique beauty that puts them at the top of the list as one of the most sought after fish in the world. The brook trout (Salvelinus frontinalis), is the official New York state fish and is actually in the Char family. It is closely related to the lake trout, more than a true trout. The splake, is an infertile hybrid of the brook trout and the lake trout. Since they are in the same family they can be cross-bred. Splake are stocked in West Caroga Lake and provide great ice fishing fun. 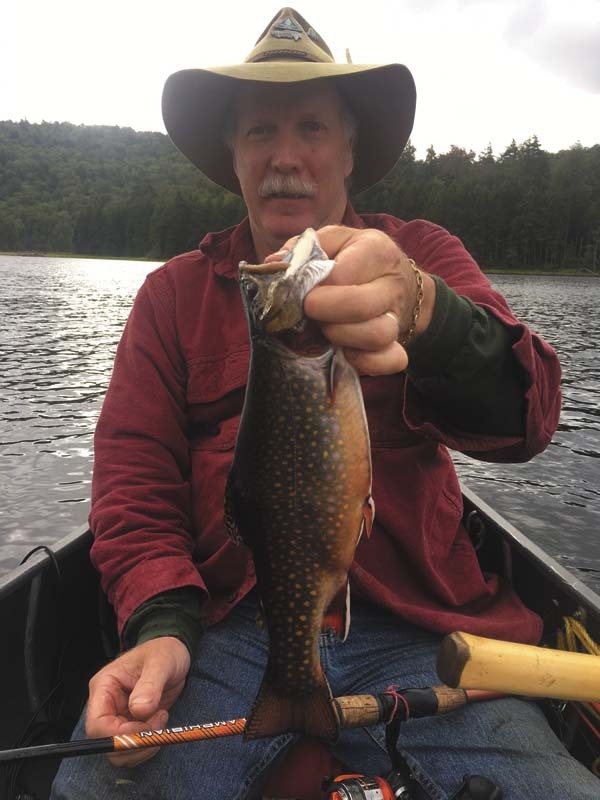 Since brook trout are primarily found in mountain ponds that are cold, clear, and that have high water quality, gaining access to productive brook trout water is one of the obstacles most fishermen face. Years ago access to remote ponds could be gained by floatplane. However, many of the ponds in the interior of the Adirondacks are off limits to floatplanes, unfortunately. Some traditional brook trout waters have boats on them but most do not. So, carrying in a canoe, rubber raft, belly boat, or kayak is necessary to fish. I have fished from shore for brook trout many times and been successful, either fly fishing or casting lures. But a boat will allow access to a lot more water, and fish. Ponds that are not easily accessible are usually those that have less fishing pressure and better fishing. The methods to catch them can vary, but I prefer to fly fish. The setup for brook trout is simple; a 4- to 6-weight rod with a weighted tip or a sinking line is preferred to get the fly down five to 15 feet with a 4 to 6 pound fluorocarbon tippet. Adding split shot may be required depending on the depth of the fish. Streamers such as the Grey Ghost, Mickey Finn, black-nosed Dace, and any type smelt pattern will work. I have custom flies that I tie that contain silver Crystal Flash with some copper mixed in. I also use leech patterns, such as the Wooly Bugger or anything with a black marabou tail. Since brook trout feed on minnows, leeches, and aquatic insects, any of these flies will “match the hatch” and work. Traditional spinning gear is used by most fisherman and using the classic Lake Clear Wobbler with a night crawler trailing 8 to 12 feet behind it has probably taken more trout than any other rig. A slow troll or drift is all that is needed to give the wobbler the action it requires to create a lot of flash and call in fish. Pay close attention to the rod tip as it will show the pulse rate of the wobbler and a fish strike. Many times, the fish will hit the night crawler and disengage from it only to come back to it. When a strike is detected, allow the lure to slide back a bit. This will imitate a stunned or wounded bait and the trout will swing back around and take that offering without hesitation. 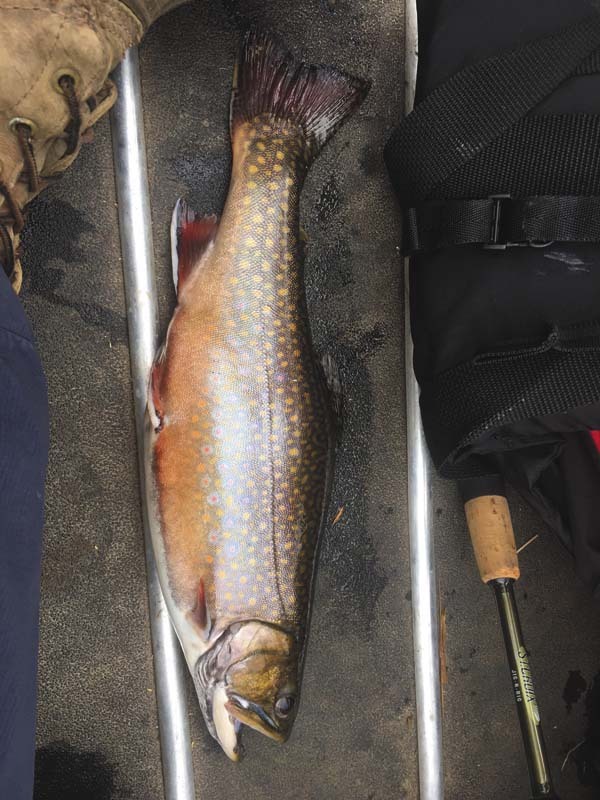 The brook trout is second to none in its unique beauty and also its excellent table fare. Fish in the 12- to 15-inch range are standard and not overlooked as a trophy by any means. These fish can be extremely finicky and there will be days when you won’t think a fish is alive in the lake, then they turn on, for some reason, and it will be spectacular. I have hiked 8 hours into a pond to stay four days and out of those four days, the fish only made their presence really known on one day. That’s fishing! If the fish aren’t biting, the experience of camping at a remote pond high in the mountains with loons, otters, beaver, bear, owls, and deer as companions is worth the price of admission. Catching a brook trout and cooking it over an open flame is icing on the cake. Remember, most people in the world will never get to experience this type of remote fishing experience that is literally in our back yard. 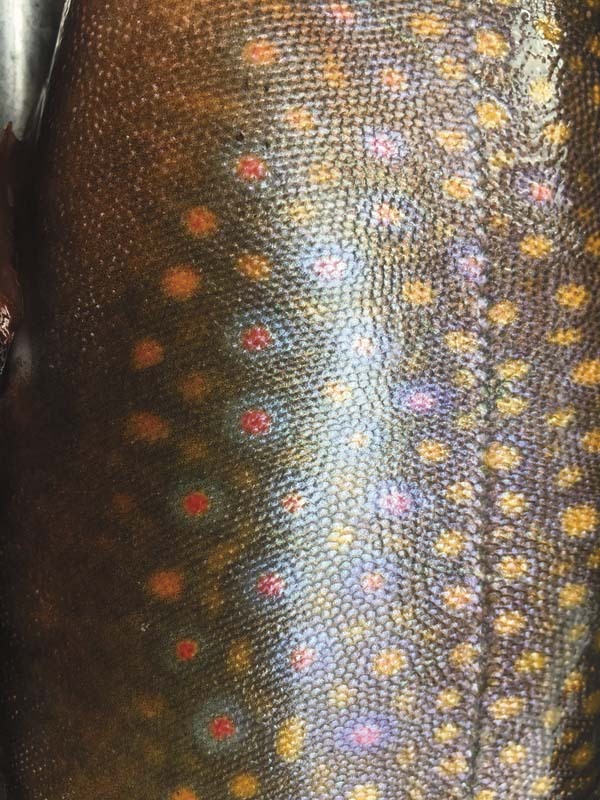 Color pattern of a brook trout.